The Bancroft Library is the primary special collections library at the University of California, Berkeley. Bancroft’s holdings include more than six hundred thousand volumes, sixty million manuscript items, eight million photographs/pictorial materials, forty-three thousand microforms, and twenty-three thousand maps. As one of the largest and most heavily used libraries of manuscripts, rare books, and unique materials in the United States, the Bancroft supports major research and instructional activities and plays a leading role in the development of the university’s research collections. In addition to these venerable attributes, the Bancroft has been at the forefront in developing standards and practices for providing online access to archival information. Bancroft was the birthplace of Encoded Archival Description (EAD) and the incubator for the Metadata Encoding and Transmission Standard (METS), both of which have enhanced access to online archival information and digital collections across the globe. As modes of access have evolved in recent years, the Bancroft has kept apace by looking at new ways to reach out to and engage users where they are working and spending their time online. To this end, the Bancroft Library recently launched initiatives to utilize Web 2.0 to further improve visibility of our archival materials. These efforts were led by the Bancroft Web Initiatives Committee, an internal library working group that looked at Facebook, Twitter, Wikipedia, YouTube, blogs, Flickr, and other Web 2.0 technologies as new methods of exposing users to archival materials. The first of these initiatives focused on creating a Facebook page1 and a Twitter account,2 both of which launched in September 2009. Overall these initiatives have been successful as measured by user feedback and access statistics. Both technologies allow us to reach out to and engage users in slightly different ways, and give us an opportunity to put threads out into the social network that will ultimately bring people back to our collections as a resource for scholarship, teaching, and learning. Facebook and Twitter are both social networking platforms, but offer very different experiences for their users. One major contrast is that Facebook is a site, while Twitter is both a site and a service. This means that users must go to Facebook,3 or use the Facebook mobile application, in order to access Facebook; Twitter feeds, however, can be read not only from the Twitter site,4 but also through other websites, such as Brizzly,5 and through third-party applications for computers and mobile devices, such as Tweetdeck6 and Tweetie.7 Users may also send and receive Twitter updates as text messages on a cell phone. While a Facebook page looks virtually identical to any user viewing it, the appearance of Twitter feeds differs greatly depending on the user’s chosen interface. These different modes of access correspond to differences in the content users may produce and format. On Facebook, users may create multilayered profiles with embedded images and videos, as well as links to other sites both inside and outside the Facebook site. Facebook offers a News Feed, which aggregates posts by, and notifications about, a user’s social network. When these posts include images, videos, or links, the content (or a preview of it) appears directly in the News Feed. A user visiting an organization’s Facebook page may find a detailed, multimedia profile as well as recent posts with their linked content. By contrast, Twitter limits its users’ profiles to user name, one user picture, real name, location, link to one website, and 160 characters of self-description. Twitter users generate tweets, which are posts limited to 140 characters or fewer. Twitter users may post links to images or other media, but cannot post or view this content directly.8 A user’s first impression of a Twitter page includes only minimal information about the organization and the text portions of recent tweets. The two sites’ different social networking mechanisms shape how users interact with other users and the content they produce. On Facebook, individual friend requests must be accepted by the recipient to take effect, whereas a user may “like” (i.e., join) an organization’s page without confirmation from the page administrators. Facebook allows responses to posts by writing a comment and clicking a “like” button. Twitter, on the other hand, allows users to follow anyone whose tweets are public without any reciprocal action. Twitter users may respond to tweets by writing a new message, using @username to reference the original poster, or by retweeting—repeating the original message with or without new commentary. The retweet function enables a message to quickly travel across networks. Twitter users can also tag their tweets using a hashtag (#), which can then be tracked by others, bringing together tweets by individuals who have no relation to each other besides this shared topic (for example, #saa10 is being used for tweets on the 2010 SAA annual meeting). Thus while Facebook tends to replicate in-person social networks within its self-contained site, Twitter promotes more wide-ranging, fluid connections among users and across the web. Taking these differences into account is necessary for an organization to communicate effectively on both sites. Implementing Facebook and Twitter was relatively easy to do but each had its challenges. While Facebook necessitated more of an upfront investment of time to design the Bancroft’s page before it was made public, Twitter requires a greater ongoing effort to connect with other users. Google Analytics tracking code for statistics gathering. Once we had chosen our selection of apps, the next step was configuring their layout on the page. Tabs were the first area of concern, as they appear in prime screen real estate at the top of the page. Only six tabs display at a time; more may be added, but the user must click on the small >> button at the end of the tab bar to view them, greatly reducing their visibility. In addition to the default Wall and Info tabs, we chose Events, Photos, Boxes, and RSS/Blog as the information we wanted to foreground for our users. We used boxes to enhance and to add to the information presented in the tabs. On the Wall tab, the Events box and a list of current exhibitions in the Extended Info box highlight our programming, while the Photos box adds visual appeal. Although the information in Events and Photos appears in more detail on their respective tabs, placing these boxes on the Wall makes this content even more visible, and occupies space on the Wall tab that would otherwise be blank. On the Boxes tab, More Extended Info provides a directory of useful links for accessing digital and print collections, as well as other Bancroft resources; Flickr Badge imports thumbnails from feeds on Flickr (the Photos app, in contrast, displays images uploaded directly to Facebook); and Favorite Pages (invisible until a page administrator adds a page as a favorite) creates a network with other pages. This structure highlights the most important information where it is most likely to be seen by the casual visitor, and provides additional resources for users interested enough to delve further. Refining these tabs and boxes also entailed determining their content. To some extent, this content was structured by the applications themselves: the Info app, for example, had a set form to fill out. When possible, descriptive content was adapted from other sources, such as the Bancroft Library website11 and print publications. While we provide basic information on our institution, our policy is to use the page as a directory rather than an end point, linking users to other existing sites rather than duplicating their content. Before making the page public, we sought not only to offer static profile information, but also to have several Wall posts already up, to give early users an idea of the kind of ongoing content updates they could expect from the site in the future: what they would be signing up for in their News Feeds when they “liked”12 the page. The final policy decisions before the page went live involved access, in terms of both who would administer the site and what content users would be able to contribute. We decided to limit posting privileges to a small group of administrators. To become an administrator, an individual must have a Facebook account and must be a Facebook friend of the page’s creator. For administrators hesitant to mix their personal and professional Facebook presences, it is possible to create a separate individual account to use only for administering the page. When an administrator posts a comment to the page, it appears under the page name (in this case, “The Bancroft Library”) whereas a “like” of a page post will be attributed to the administrator individually. Users may comment upon or like posts, but may not post content themselves. While some institutions, such as the British Library,13 have chosen to allow users to post directly to their walls, that route requires an active moderator to remove inappropriate or off-topic posts. Focusing user contributions to the site on responses to Bancroft-generated content allows interaction, keeps the emphasis on Bancroft materials, and reduces the amount of staff time necessary to manage the site. Designing our Twitter presence was a much simpler process. While Facebook required administrators to log in to their individual accounts in order to edit the page, Twitter allowed us to create a dedicated Bancroft account directly accessible to all administrators. Each Twitter account requires a unique email address not used by any other Twitter account, which receives notifications of new followers. Bancroft’s profile is simple: our institution name and location, a link to our website, and a one-sentence description of the Bancroft. We chose an image from our letterhead as our profile picture, and configured the color scheme on our profile page to harmonize with the photograph of our building that we chose as a background. Unlike Facebook, where our page was developed offline before being made public, our Twitter feed was available as soon as it was created; we immediately posted several tweets to create content for our page beyond the minimal profile information. Once our Facebook page and Twitter feed were available online, our next concern was publicizing their existence. We began with notifications on internal library listservs, which also identified the administrators so other staff members would know whom to contact when they have information to post, and a link on the Bancroft website. On Facebook, users who “liked” our page displayed it on their News Feeds. On Twitter, followers retweeted our tweets or posted about our new account, spreading the word. Eventually, our Twitter account also began to appear on lists, user-curated groupings of related feeds. In addition to word of mouth (or post, or tweet), our Facebook page and Twitter account could also be discovered through direct searching on the respective sites. Once users “liked” our page or followed our feed, we sought to engage them with a continual (but not overwhelming) stream of updates. Each weekday morning, a staff member posts the Digital Object of the Day, a digitized image or text from the Bancroft collections that is usually related to current or historical events of that day, with a brief, often lighthearted commentary. Each staff member has a unique method for choosing these digital objects, resulting in a diverse array of selections. The Digital Object of the Day reveals items from the collections serendipitously; clicking on the image link takes a user to its source on the Online Archive of California site, which is open to browsing. These posts can thus serve as a discovery tool for the Bancroft’s digital collections. Other content derives from news articles or blog posts, which are collected through Google Alerts. This material can include reviews of books based on Bancroft research and exhibitions of Bancroft objects elsewhere, as well as news items about materials in the Bancroft collection (the Drake Plate, a well-known local hoax, tends to reappear every April 1). The sites also disseminate internal news items of interest to the public, such as new acquisitions, newly processed or digitized collections, upcoming events, and current exhibitions. In December 2009, Bancroft and the California Digital Library co-hosted an online “event” to highlight the John Muir Correspondence Collection. During this event, updates were made on Facebook and Twitter with brief quotes from texts by Muir, along with links to the digitized letters. Actively maintaining a flow of interesting content is key to gaining new fans and followers, and to keeping existing ones. Most of our updates are posted in duplicate, appearing on both Facebook and Twitter.14 Some material, however, only appears on one site: links to Facebook event pages only make sense on Facebook, and retweets work best on Twitter. Each site requires additional unique attention. On Facebook, page administrators periodically scan user comments to check for inappropriate remarks and to respond to questions. Our Twitter account follows the feeds of a small number of allied institutions, and periodically retweets or comments on their posts, as well as on posts by other users responding to our content. These interactions promote connection and communication with the larger Twitter community, and also have the potential to attract more people to our feed. While our Facebook and Twitter updates are largely similar, the different structures of the two sites require different kinds of ongoing administrative engagement. We chose to use statistics to determine the extent to which users are encountering and engaging with our content, and thus to assess our progress toward our goal of communicating archival information through online social networks. Facebook and Twitter each present their own challenges for identifying and collecting statistical data. For both sites, we focus on a few common criteria: the number of posts or tweets, the number of fans or followers, the number of interactions, and the number of clicks on posted links. Each site offers its own statistical tools of varying degrees of completeness and specificity; we also turned to third-party sites to gather additional information. Facebook offers multiple options for accessing use statistics that are automatically available to page administrators. The Insights page, accessible from the page’s Wall, provides several charts and graphs which track the amount of content, subscriptions and unsubscriptions, and the demographic breakdown of fans and commenters. Facebook also sends out a weekly email to page administrators giving an account of new fans, interactions (Wall posts, comments, and likes), and visits to the page. While this data gives a general sense of the current state of the page and of its progress over time, its unwieldy format resists more detailed analysis. The Insights page presents the bulk of its information in line graphs; an administrator must mouse over specific dates in order to see the exact number for that date. The weekly email lumps together Bancroft-produced content (posts) with user responses (comments, likes), and does not specify the exact span of time it covers. We found it useful to supplement these offerings with a weekly manual count of posts, comments, and likes, recorded along with the data from the Insights page and email in a spreadsheet. Twitter offers minimal statistical data. The current numbers of tweets, followers, and lists are part of the display, but the site does not provide any way to track progress over time. Third-party sites such as TwitterCounter15 offer some additional data, but most of our Twitter statistics are gathered manually. We record our total number of followers at about the same time each week, as well as the number of lists on which our feed is included; we also count tweets from @bancroftlibrary and mentions/retweets by others from the past seven days. To track the number of clicks on the links posted to both sites, we use bit.ly,16 a URL redirection service: paste a link into the box on their site, and they will shorten it so that it more easily fits on one line in an email or within the 144 characters of a tweet. Because all clicks on this shortened link go through bit.ly’s server, users can track the number of clicks a link receives and the source of those clicks, as well as how many other people are using bit.ly to link to that same page. By creating a bit.ly account and using bit.ly links on Twitter and Facebook, we are able to track traffic for our links. Bit.ly does, however, present some difficulties. Its data summary page displays information either from the past hour, the past seven days, or the past thirty days in a rolling window, making it difficult to extract statistics for a particular time period. Also, Twitter-based clicks that come from other sites, apps, or devices are lumped in with other direct click sources, such as email and instant messaging services. For our purposes, we assume that non-Twitter traffic from these sources is minimal and attribute all such traffic to Twitter in our statistics, but this assumption creates a degree of uncertainty in the data. In addition to bit.ly, we are able to track Facebook and Twitter hits to resources hosted by the California Digital Library (CDL),17 such as the Digital Object of the Day, through the CDL’s internal statistics. Gathering this data entails keyword searches in the monthly referrer lists for “facebook” and “twitter,” and then manually adding results from different subdomains. This process may also include clicks coming from sources other than the Bancroft’s Facebook page and Twitter feed. These multiple approaches to statistics-gathering offer different views of how social media affects traffic to our digital resources. One set of data that is surprisingly impossible to track is the number of views a particular post or tweet receives. We can count the number of fans or followers in whose feeds a given post or tweet appears, but some of those may not actively follow their feeds, or may have been offline for that particular day. We can also count the number of people who actively engage with a posted or tweeted link by clicking on it, commenting on it, or retweeting it, but that number is presumably much smaller than the number of views the post or tweet itself receives. Moreover, these numbers do not include the people who land on our page or profile and view our content, but do not become a fan or a follower. Thus we can only estimate the number of people who encounter our content but do not act upon it. The detailed data we collected from March to June 2010 did not offer any ready correlations between the amount of user interaction and the number of posts made, or between interaction and the total number of fans. The number of interactions in all categories—likes and comments on Facebook posts, retweets or mentions of tweets, clicks on bit.ly links—fluctuated from week to week. Weeks with more posts on Facebook did see slightly more interactions, but high-tweet weeks on Twitter did not reliably produce more retweets, mentions, or clicks on links. Our total number of Facebook fans increased by one hundred from March to June 2010, but the number of user interactions was in the same range at the end of that period as at the beginning. During the same time period on Twitter, our number of followers increased by fifty; we saw an upswing in retweets and mentions in the last few weeks of that period, but at the same time there were fewer clicks on the posted links than at the start of our recordkeeping. On both sites, interactions tended to be from the same small group of active fans or followers. Thus neither more content nor more users translated into greater user response as a general rule; instead, a small number of dedicated users were consistently responsible for the majority of the interactions. The amount of Facebook- and Twitter-derived traffic at the Online Archive of California,18 which hosts Bancroft digital objects and finding aids, has also fluctuated since the implementation of the Bancroft’s Facebook page and Twitter feed. Each site has its own ups and downs independent of the other: the greatest number of Facebook hits in a month (298) occurred in March 2010, while Twitter’s high point (193) was in September 2009; Facebook’s low (166) happened in May 2010, while Twitter dipped to 42 hits in January 2010. Since virtually the same content was posted to the two sites, these results suggest that our Twitter and Facebook users tend to be interested in different content. The John Muir virtual event in December 2009, hosted by the California Digital Library with digital content from the Bancroft Library and the University of the Pacific, offers somewhat more conclusive results as to the effectiveness of social media efforts in leading users to archival materials. During the month of this event, the five highlighted digital objects from the Muir correspondence collection were among the most popular of UOP’s items on the Online Archive of California in terms of hits: three placed in the top ten, and all five were in the top thirty. In contrast, during the previous month the most popular of these digital objects had ranked only thirty-second. During the month of the event, referrals from Facebook and Twitter constituted nearly 5 percent of traffic to UOP’s OAC collections, while in the previous month the digital collections did not receive a single hit from either site. The John Muir event thus resulted in a notable increase in traffic for this digital collection, and made a sizeable improvement in its visibility. 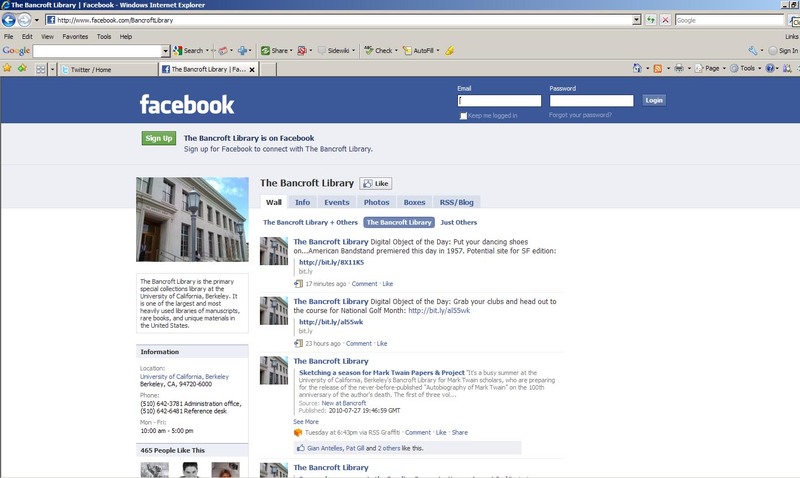 At the end of the first nine months of implementation (from September 2009 to June 2010), the Bancroft has 423 Facebook fans and 239 Twitter followers. Bancroft staff members have produced over 260 Facebook posts and a similar number of tweets. Our online digital collections have received a total of over one thousand nine hundred hits from Facebook and over nine hundred hits from Twitter. Despite the fluctuations in response levels, these results suggest that our use of social media has been effective in bringing digital archival materials to a broader audience, and in promoting user engagement with these materials. In the end, we feel the effort has been worth the time spent, and that this will be the first of many ways we will reach out and engage users. Play to an individual site’s particular strengths. All social media is not created equal. Be conscious of the different options presented by different sites, the site’s culture, and the specific ways in which users interact with content on those sites. Our Wall posts on Facebook met with a positive response and produced some back-and-forth in the comments, but the Discussion box hidden away on the Boxes tab remained empty (we eventually removed it). While Facebook’s display of thumbnail images for links allows for witty interplay between the text of a post and its accompanying illustration, Twitter’s text-only approach and 144-character limit best suits pithy, engaging comments that intrigue a user enough to click on a link. (Also, making tweets shorter than the limit allows for easier retweeting.) Tailor your content to be maximally effective within the structures and culture of the site hosting it. Engagement with social networking is most productive as an ongoing commitment. Many users interact with Facebook and Twitter primarily through an aggregated feed, rather than by visiting individual pages. To maintain sustained user interest in a site or feed, it is necessary to stay visible by providing a continual stream of new content. At the same time, providing too much information can overwhelm users. Designing a moderate yet stable posting schedule is the best way to keep the relationship between your site and its users alive. Design the gathering of statistics into your workflow from the start. Twitter and Facebook provide some statistical data automatically, but it is not enough to get a full picture of how users are interacting with your content. Once we implemented bit.ly, we were able to get a clearer picture of how many people we were drawing to our digital resources through our social media efforts. Create a plan for gathering statistical data as part of the implementation process, evaluate the site-provided statistics for gaps, and seek out third-party sites or applications that provide the information you require. Respond to users rather than only letting them respond to you. Active interchange with users can make for a more interesting site, one in which users are more invested. Engaging with users can also point out elements of your practices unrealized by site administrators. For example, a fan of our Facebook site responded to an image posted as a lighthearted first-day-of-school picture by pointing out that the photograph had been taken at a World War II Japanese internment center. This interaction highlighted the importance of maintaining an awareness of the original context of an image or other digital object, and of providing additional information when necessary in order to transfer that context to another setting. Be consistent. While adapting to changing circumstances is important, so too is maintaining a consistent online identity for your institution. Create expectations among your users as to the kind and frequency of content they will receive from your posts, and meet those expectations. While we post a variety of information to our feeds, having the daily ritual of the Digital Object of the Day means that our fans and followers can expect an interesting image or other digital object from us each weekday morning. The popularity of the Digital Object of the Day feature suggests that users appreciate its regular presence in their feed. The Facebook and Twitter technologies have been useful platforms for learning about being part of online social environments, but they are just the tip of the iceberg. Our hope is that by using these and other technologies we can engage users and communicate archival information through a network of online communities, and reach those users who are already participating in these social spaces. While these technologies have taught us a great deal, we also realize that these will not be the last tools we use to reach out to these users. If there is one principal lesson we have learned over the past nine months, it is that these environments are constantly evolving. The tools are changing and new tools are emerging before our eyes. Simply looking at the recent changes to Facebook privacy policies alone gives some hint as to how fast these technologies are evolving and responding to changes in user demands. We will need to evolve with them. We need to stay current, fresh, and engaged. Going forward, we plan to continue to experiment with new Web 2.0 tools and technologies as they become available, and implement those that provide fertile opportunities for us to reach out to and share archival information with users. We acknowledge that the future of archival information access is on the Web and some of that will be through these social environments. For our institution to remain engaged with users, we need to be out there participating in these environments on some level. Put simply, it is how we work today, and how we will be reaching users in the years to come. DIOSA Communications, “Facebook Best Practices for Nonprofit Organizations,” DIOSA Communications, http://www.diosacommunications.com/facebookbestpractices.htm. Facebook, “Help Center,” Facebook, http://www.facebook.com/help/. Webdigi, “Google Analytics for Facebook Fan Pages,” Webdigi, http://www.webdigi.co.uk/blog/2010/google-analytics-for-facebook-fan-pages/. DIOSA Communications, “Twitter Best Practices for Nonprofit Organizations,” DIOSA Communications, http://www.diosacommunications.com/twitterbestpractices.htm. “Twitter—Library Success: A Best Practices Wiki,” http://www.libsuccess.org/index.php?title=Twitter. Twitter, “Twitter Help Center,” Twitter, http://support.twitter.com/. Mashable, “HOW TO: Track Social Media Analytics,” Mashable, http://mashable.com/2009/04/19/social-media-analytics/. 1. Bancroft Library, “The Bancroft Library,” Facebook, http://www.facebook.com/bancroftlibrary (accessed July 6, 2010). 2. 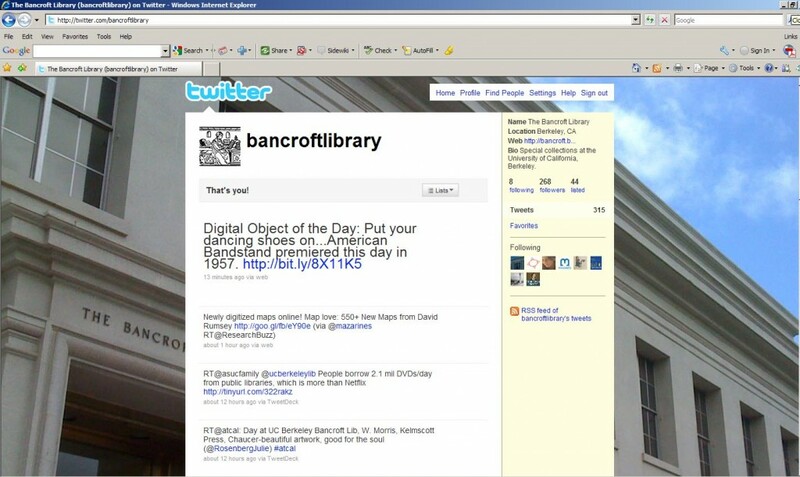 Bancroft Library, “The Bancroft Library (bancroftlibrary) on Twitter,” Twitter, http://twitter.com/bancroftlibrary (accessed July 6, 2010). 3. Facebook, “Welcome to Facebook,” Facebook, http://www.facebook.com/ (accessed September 27, 2010). 4. Twitter, “Twitter,” Twitter, http://twitter.com/ (accessed September 27, 2010). 5. Thing Labs, Inc., “Brizzly: A Simply Way to Experience the Social Web,” Thing Labs, Inc., http://brizzly.com/ (accessed September 27, 2010). 6. TweetDeck, “TweetDeck,” TweetDeckhttp://www.tweetdeck.com/ (accessed September 27, 2010). 7. atebits, “Tweetie for iPhone”, atebits LLC, http://www.atebits.com/tweetie-iphone/ (accessed September 27, 2010). 8. Users who have Brizzly as their point of Twitter access are the exception to the link-only rule, as this site displays linked media content as part of the feeds a user follows. 9. Facebook, “Facebook Pages: Creating, Administering and Editing your Page,” Facebook, http://www.facebook.com/help/?page=904 (accessed May 25, 2010). 10. Other category options relevant to archives are Museum/Attraction and Government; the Info portion of the page changes slightly depending on the category. 11. Bancroft Library, “The Bancroft Library,” University of California, http://bancroft.berkeley.edu/ (accessed September 27, 2010). 12. “Like” replaced “Become a fan” in April 2010 as Facebook’s terminology for the process by which users affiliate themselves with an organization’s page. The nature of the affiliation remained the same: users display the page on his or her profile and receive updates from the page in their News Feeds. We will continue to use “fan” to refer to a user who has “liked” a particular page. 13. British Library, “The British Library: the World’s Knowledge,” British Library Board, http://www.bl.uk/ (accessed September 27, 2010). 14. It is possible to set up automatic reposting to a Twitter account through Facebook, automatic reposting to a Facebook account through an application such as Tweetdeck, or to use a third-party site such as Ping.fm to post simultaneously to both sites. We decided, however, to continue manually posting in both places, to give us more control over what content appears on each site and how it is formatted, given the different structures and use patterns for the two sites. 15. TwitterCounter, “Twitter follow stats, graphs, and widgets,” TwitterCounter, http://twittercounter.com/ (accessed September 27, 2010). 16. Bit.ly, “Bit.ly: Shorten, Share, and Track Your Links,” Bit.ly, http://bit.ly/ (accessed September 27, 2010). 17. California Digital Library, “CDL: California Digital Library,” University of California, http://www.cdlib.org/ (accessed September 27, 2010). 18. California Digital Library, “OAC: Online Archive of California”, University of California, http://www.oac.cdlib.org/ (accessed September 27, 2010).